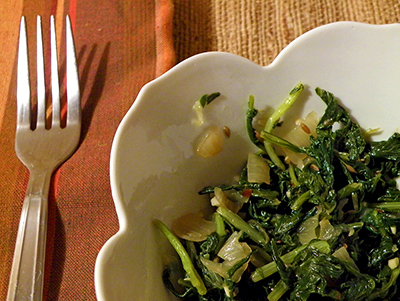 My husband approaches spicy greens with some trepidation and doesn’t like them raw. I have tried sneaking them into salads, but finally he drew the line and said, “No arugula in my salad! It tastes like dirt!” I do like arugula in my salad, but can’t eat all of it. 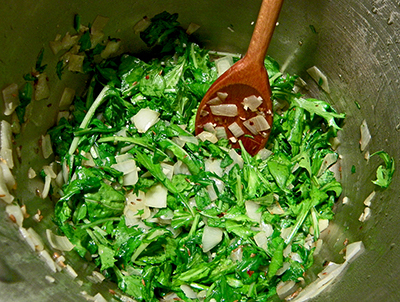 We also received mustard greens this week, which we’re not familiar with. LEF recipe maven Debbie provided this intriguing recipe: imagine adding more spices to spicy greens! Since we had less than a large bunch of mustard greens, I added the arugula too. The results were outstanding. My husband declared it dark and smoky, and delicious. It complimented our lemon-cilantro baked chicken dish and salad well. I recommend using a wood-aged balsamic vinegar from Modena . A little pricey, but stunning flavor, and you don’t need much. Cheaper, thinner balsamics won't stand up to the spicy greens as well, though you can compensate a little by adding more. I reduced the amount of oil from 2 tbsp. to 1 tbsp. That worked fine for us, but adjust it as you prefer. Heat oil in a large wide pot over medium-high heat. Add onions and saute until soft, about 5 minutes. Stir in garlic, cumin seeds, and crushed red pepper; saute 2-3 minutes more. Add mustard greens to pot in batches and stir until each batch begins to wilt before adding next, about 3 minutes per batch. 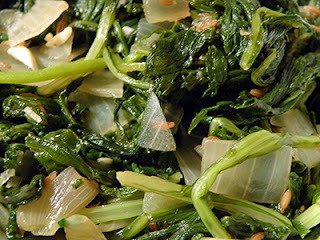 Reduce heat to medium-low, cover, and cook until greens are very tender, stirring frequently, about 30 minutes. Season with salt and pepper. Mix in vinegar. Transfer to a bowl and serve hot or at room temperature.